The United States has given the world 85 Nobel Laureate Physicists, followed by the UK and Germany at 24 each. 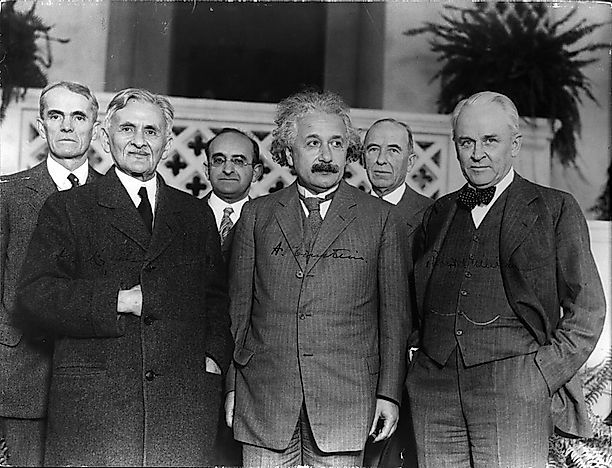 Three Nobel Laureates in Physics: Front row: Albert A. Michelson (1907 prizewinner), Albert Einstein (1921 prizewinner) and Robert A. Millikan (1923 prizewinner). Alfred Nobel was most known as the inventor of dynamite, but he was also an engineer, chemist, innovator, and arms manufacturer. Nobel amassed a substantial fortune from his many business ventures and successes. In 1895, he made a will bequeathing a large part of his money to the formation of the Nobel Prize. The awards would recognize achievements of deserving persons regardless of race or creed, in five fields of study namely: Physics, Chemistry, Literature, Peace, and Medicine. After his death in 1896, the Nobel Prize was organized, and the Nobel Foundation initiated the guidelines for the Nobel Prize. The last quarter of the 19th century was a time of transition from Classical Physics to a new era with the discoveries of X-ray, radiation, and electron. Thus, at the turn of the 20th century, modern Physics was born with giants of Physics like Einstein, Curie, Rontgen, and Thomson leading the discipline. It was a time when Physics was considered foremost of all sciences. The science of Physics was the first award that was mentioned in Nobel’s will among five categories.The Royal Swedish Academy of Sciences is the body that gives out the Nobel Prize in Physics every December 10 in Stockholm, Sweden. Wilhelm Conrad Röntgen, a German, was the first recipient of the Nobel Prize in Physics in 1901 for discovering the x-ray. The United States has 85 Nobel Laureate Physicists. Albert Abraham Michelson was the first American recipient in 1907. Among the most recent are David J. Wineland in 2012 and Adam G. Riess, Brian P. Schmidt, and Saul Perlmutter in 2011. The United Kingdom has 24 Nobel Laureate Physicists. Lord Raleigh was the first recipient in 1904. Most recent are Peter Higgs in 2013; Andre Geim and Konstantin Novoselov in 2010. France has 12 awardee physicists, recipients of the Nobel Prize. Antoine Henri Becquerel was the first recipient in 1903, with Pierre Curie and Maria Sklodowska-Curie. Most recent recipients are Serge Haroche in 2012 and Albert Fert in 2007. Russia has about 10 Nobel Laureates in physics. Ilya Frank, Pavel Cherenkov, and Igor Tamm were the first recipients in 1958. Most recent is Vitaly Ginsburg in 2003 and Zhores Alferov in 2000. The Netherlands has 8 Nobel Laureate physicists. Hendrik Lorentz and Pieter Zeeman were the first recipients in 1902. Most recent are Gerard ‘t Hooft and Martinus Veltman in 1999. Next, are countries that also have Nobel Laureates in Physics namely: Japan with 6 awardees, Sweden with 4 awardees, and Switzerland with 4 awardees. Next, Austria, Canada, China, Denmark, and Italy each are tied with 3 awardees each. The Nobel Prize in Physics may be awarded to a limit of three Nobel laureates and for two different achievements in the field of physics. The arduous task is started with the chosen candidates appointed by several thousand people asked to nominate their choice. A panel of experts is tasked to bring down the number of nominees to just 15 names. Afterward, a report is made in their final choice with further discussion continuing to eliminate other nominees. The final awardees are chosen by majority vote. The Nobel laureate in Physics is considered the foremost award in the discipline of Physics. This system makes it the most scrutinized among all the Nobel Prize awards.